Conifer@41 v Port Elizabeth, Jižní Afrika: Zarezervujte nyní! A deposit of 50% of the balance to be charged to guests credit card is required to secure the booking. No refunds unless otherwise negotiated directly with Manager. Email address as provided to be used for all communication. The following group types are not accepted by this hostel: Holiday with Friends, Junior / Primary School, Stag/Hen/Bachelor Party If you have misrepresented the type of group you are booking for, your booking may be cancelled by the hostel." 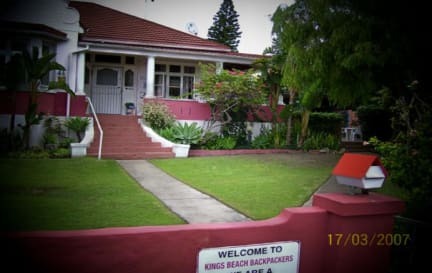 We are 150 m away from the beach at 39 - 41 Windermere Road which is the second road up from Beach Road. 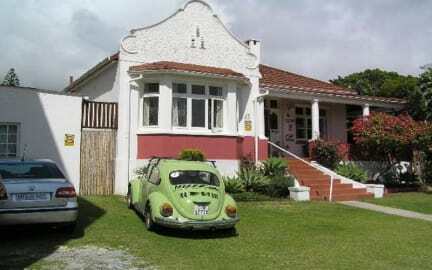 Our suburb is quiet and secure and in safe walking distance to many of the restaurants, pubs, clubs on our beachfront. We are the closest hostel in Port Elizabeth to the Boardwalk/Casino complex. A 5 min walk down to Beach Road takes you to Bayworld complex which houses the main Museum and Oceanarium. There is a communal kitchen in the house for all guests to use as no meals are provided at Conifer@41.. The rooms in the main house are as follows: All have secure on-site parking and barbeque facilities available. Room 11 – a large sunny room - can sleep up to 4 pax in 4 single beds, or 1 king and 2 singles, with shared bathroom. The rate is R 300.00 per person per night. Room 12 – a smaller room - can sleep up to 4 pax on 2 double bunks with shared bathroom. The rate is R300.00 per person per night. Room 15 – a cosy room – can sleep up to 4 pax on 1 double bed and 1 double bunk with en suite bathroom The rate is R200.00 per person per night. Room 16 – a large sunny room – can sleep up to 4 pax on a king or twins bed and a double bunk with shared bathroom The rate is R200.00 per person per night. We arrange outings to Kraggakamma Game park and also to Seaview Lion Park. We also arrange daily trips to Addo Elephant Park and Schotia Game parks for day/night safaris. We offer township tours which introduce our visitors to the local people and a different culture; visit schools, artists, Nelson Mandela museum, shebeens (taverns) Activities such as sandboarding, surfing, horse-riding, boat cruises to St. Croix and Bird Islands for whale, dolphin and penguin viewing can be arranged.